T: The chestnut is even more pronounced on the palate, but it’s along with the base combination of bourbon & sherry casks that makes the profile as a whole so characterful. Vanilla-nutty butters & biscuits [macadamia, pumpkin seeds, savoury-halva], ginger bread, Hobnobs,... Some [rose] floral alongside wild strawberries bloom in the latter stages. Later on there’s a development of a particular sour note that fans of Amazannaise will know well - the related notes here being wine vinegar, lemon juice & guar gum - though not sure I’ve ever tasted guar gum in isolation however. Water acts to release another layer of consolidated=complex fruity/woody wonders. C: A distinctive flavour that I thought I’d tire of very quickly. Turns out it’s planted in me the occasional craving. An ideal dram pour when you’re undecided what to have late at night and don’t want to work too hard for good returns. Next mission, a chestnut flight - Irish & Scottish side by side perhaps? Not so bad at first. The 46% can not hide the fact that a young single pot still sloshed in the glass, but to a 15yo Redbreast or Powers Johns Lane, both also bottled with 46%, he does not come up. Nevertheless, there is potential in it. Freshly poured, it is rather reserved and watery. If you give it but a few minutes in the glass come fresh ginger and mint, rosemary and cloves. 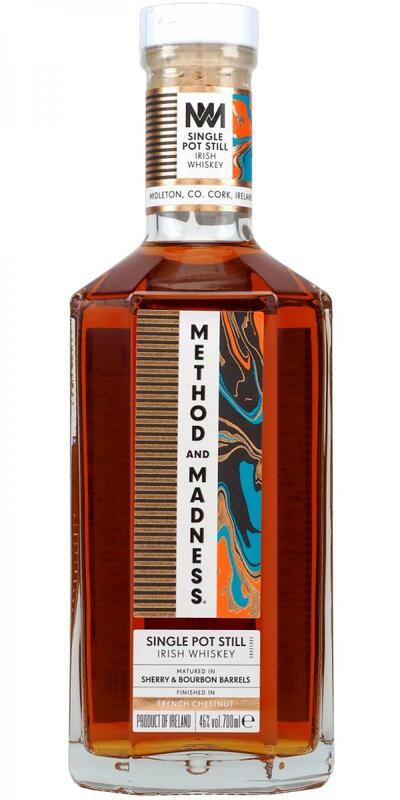 Fresher than the usual single pot still - spices. Add lime and banana, vanilla and milk chocolate. The spices from the nose with banana nut and grated apple. Already very dry at the beginning. Although he can not be old, one means to chew on a branch - which sounds more unpleasant than it actually is. The fruits soften the wood taste. Dry and medium-long, with vanilla, oak shavings and again banana sauce. A little Nutella side on the nose. Atypical agree but a bit messy especially with a small side cardboard. In the mouth already more convincing. Redbreast's identity is relatively easy to drink. Open 01.04.17, emptied 17.03.18. Almost a year open, not a whiskey that benefits from oxygen. Towards the end he looked thinner than shortly after opening. A round, delicious and light tropical Irishman, nicely done. Has been matured in a combination of ex-oloroso Sherry and ex-Bourbon barrels, before being transferred to chestnut casks sourced from the Isére region in France.